Last week, a report surfaced that Supergirl co-creator/executive producer Greg Berlanti's deal with CBS allowed for the show to crossover with his other DC Comics series, The CW's Arrow and The Flash. Even though CBS and CW are much different networks, the crossover is plausible, since CBS owns half of The CW along with Time Warner. 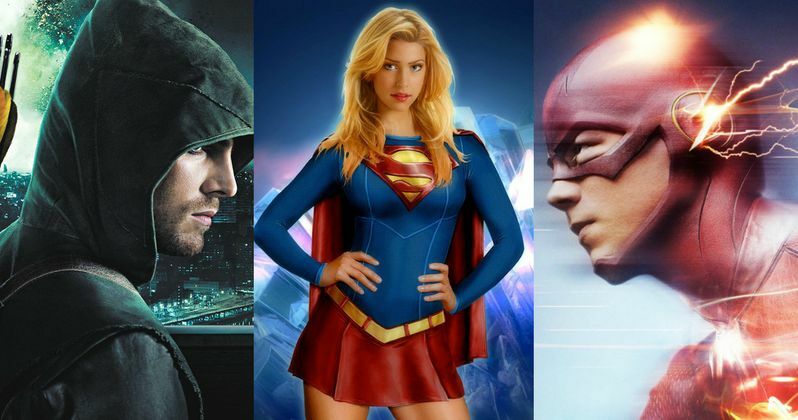 However, during CBS' TCA Winter Tour presentation, network chairman Nina Tassler shot down reports of a potential crossover between Supergirl and The CW's Arrow and The Flash. "That's a different network so I think we're going to keep Supergirl to ourself right now." When asked about what drew her to the pitch from Greg Berlanti and Ali Adler, Nina Tassler had this to say. We fell in love with the pitch. She's a great character. I love the superhero genre....There is a human drama there. I think we're watching an evolution with regard to the way that superhero characters are portrayed. There's a humanity. They're flawed. There's a relatability. For our network right now, what we did respond to was the character's humanity, the other characters in the show as well - the story trajectory and the character's arc and growth. These are all things that made her just imminently relatable, and made the story exciting. We made a decision based on the pitch that we heard." When asked about specific details of the pitch, Nina Tassler revealed the issues that Kara Zor-el will be dealing with when Supergirl debuts. "It's a wonderful amalgamation of the mythology of the character with kind of a very modern coming of age. She's a very strong, independent young woman and she's coming into her own. She's dealing with family issues. She's dealing with work issues and it's a female empowerment story. You look at the strong female characters we have on the air, it really is resonant of that. We're big feminists. It's her intellect, it's her skill, it's her smarts. It's all of those elements. It's not just her strength, which she does have." Casting is currently under way, with Greg Berlanti revealing yesterday that fans should hear who will play Kara Zor-el very soon. Nina Tassler added that whoever plays Supergirl should be an "every woman." "She's got to be an every woman. She's got to be specific. She's got to be a terrific actor. I think back to having had the good fortune of being at Warner Bros. when we were doing Lois & Clark, the chemistry between Dean Cain and Teri Hatcher was really wonderful. So I think in this case, it's looking for someone who embodies both the freshness and the exuberance of being a young woman in today's challenging climate and being someone who can carry this kind of series on her shoulders. It's a big, big show." Nina Tassler also said that the Supergirl costume is "awesome," and that the show will be more of a crime procedural, with the title character solving a crime every week. There will also be serialized elements woven into the show. "There will be [crime] cases, but what [executive producers] Ali Adler and Greg Berlanti pitched was a real series arc for her. The beauty of it is now with shows like The Good Wife and Madam Secretary, you can have serialized story elements woven into a case of the week. She's a crime solver, so she's going to have to solve a crime. She's going to get a bad guy."